Today’s lovely and deeply spiritual piece of music is Tyagaraja’s kriti in the mystical Raga Vagadeeshwari. I can imagine that he must have been in a meditative and blissful mood when he wrote this music as it draws us into a deeply contemplative state. What an unusual composition this is! Instead of referring to any particular deity, Tyagaraja sings of the Supreme Consciousness (Nirguna Brahman). He says ‘Know the grandeur with which the Supreme Lord is luminescent in Vishnu, Shiva, the celestials, men, millions of universes’ and goes on to point that the same Supreme Entity brilliantly shines in ‘animals, birds, mountains, trees which are made up of the five elements’. This is not a song of prayer, but a song of affirmation from one who has seen and has known. Following from Tyagaraja’s mention of the पञ्च भूत (Pancha Bhoota) or the five elements decreed by the Vedic seers, I will dwell a bit on its significance. The Vedic sages nominated पृथिवी (Earth), अप् (Water), वायु (Gas), तेजस् (Vital Power/Energy also Fire), आकाश (Vacuity, Ether, Absolute Brahman ब्रह्म) as the basic elements which make up this world. Three of these are in fact common with ancient Chinese thinking as well. My interpretation is that the first three represent all matter as they exist in one of the three states – Solids, Liquids or Gas. तेजस् (Energy/Fire) represents Energy which we know can convert to and be converted from Matter. 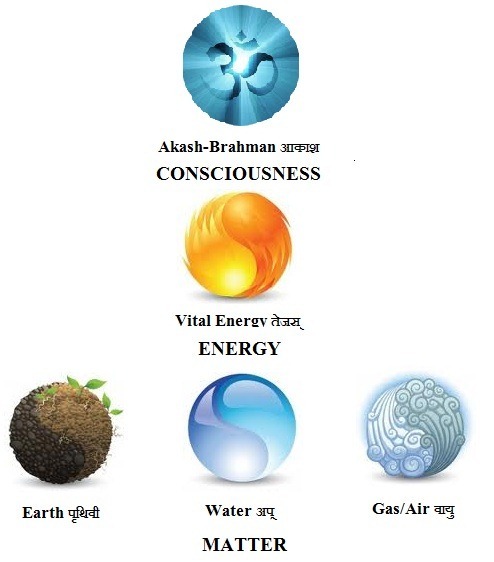 This also represents Life Force; except for that, the first four Bhootas are governed by Physics. The fifth, आकाश represents Absolute Consciousness or ब्रह्म. I recently read another non-traditional interpretation where the author equates the Pancha Bhootas as Space (Akaasha), Planck’s energy (Vaayu), Newtonian energy (Agni), elemental atom (Jalam), and molecule and molecular aggregate (Prithvi). (Reference) Yet another interpretation is described here. Whatever the interpretation, the five Vedic elements cover both the physical and metaphysical world. Coming back to our song of today, Tyagaraja brings our attention to the Brahman, the Absolute Consciousness, which shines out of all beings in the Universe (or multiple Universes). And in doing that, focuses our thoughts on how we all are part of the One. For lyrics and translation, see footnote. To read a bit more about this raga, click here. Though I have heard so many singers perform this song, I find it difficult to get past the great Maestro Balamurali Krishna. Here’s his rendition from the CD Tyagaraja Tattvabodha Kritis. You can find here the full performance including the Raga Alapanai. For an instrumental version, listen to the young and very talented Akkarai Subhalakshmi on the violin. Know unerringly the grandeur with which the Supreme Lord shines through! In all and as all of Lord Vishnu, Lord Siva, celestials, men, entire millions of universes (the Supreme Lord is resplendent). In millions of animals, birds, mountains and trees which are made up of space, air, fire, water and earth, in the describable and the indescribable (the Supreme Lord is resplendent). And in this the good Tyagaraja and others have sought refuge. For lyrics in Telugu, Tamil, Malayalam and word by word meaning, click here.